*Please note: In an effort to represent these documents as precisely as possible, they were reproduced as written. Therefore, some grammar mistakes were deliberately included. **PLEASE NOTE: IT WAS IMPORTANT FOR ME TO SHOW THAT SPENCER AKA. COLOMBARO WAS CONVICTED IN THE TWO COURTS OF JUDGEMENTS – CRIMINAL AND CIVIL. O.J.SIMPSON WAS ONLY CONVICTED IN ONE. **PLEASE NOTE: ALTHOUGH I WAS AWARDED A LARGE AMOUNT OF MONEY IN CIVIL COURT FROM HARLEY SPENCER AKA. EUGENE COLOMBARO, NO MONEY – ZERO DOLLARS – WAS COLLECTED FROM HIM OR ANY OTHER ENTITY. OVER THE YEARS, THE MURDER OF MY CHILD COST ME OVER $375,000. I STOPPED COUNTING IN 2002. 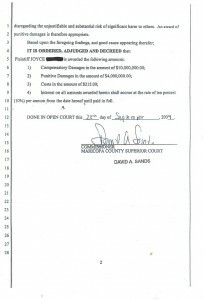 This matter having come on before the Court on Plaintiffs’ Motion for Entry of Default Judgment and the Court having reviewed the pleadings of record, the documentary evidence submitted and the testimony of Plaintiff JOYCE CLARK, the Court finds that the Defendant was regularly served with process and failed to appear and answer Plaintiffs’ Complaint within the period prescribed by law, that the default of the Defendant was duly entered by the clerk of this Court, that the Defendant is neither an infant nor incompetent, that Defendant is not in military, and the Plaintiff JOYCE CLARK is entitled to the relief requested. 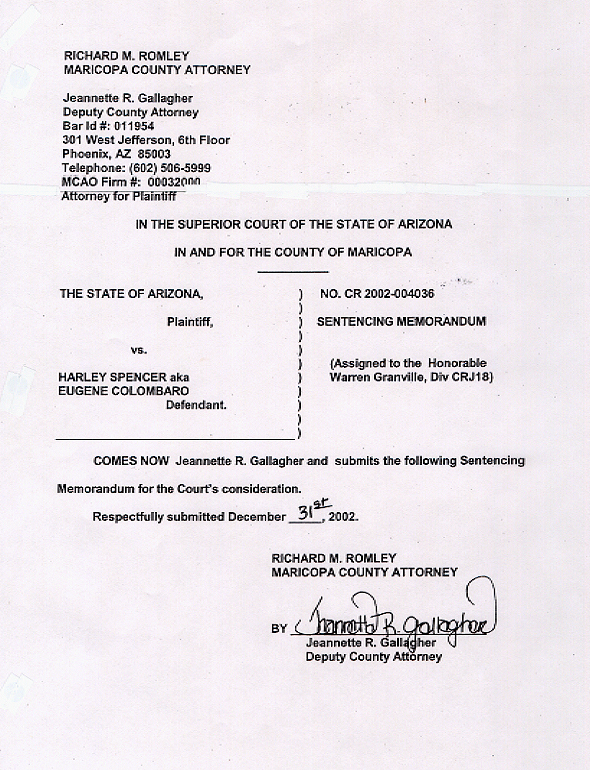 That the evidence is clear and convincing that the actions of Defendant HARLEY SPENCER (aka Eugene Colombaro) forming the basis of this action were willful and malicious, that the evidence is clear and convincing that Defendant HARLEY SPENCER (aka Eugene Colombaro) engaged in aggravated and outrageous conduct with an evil mind consciously disregarding the unjustifiable and substantial risk of significant harm to others. 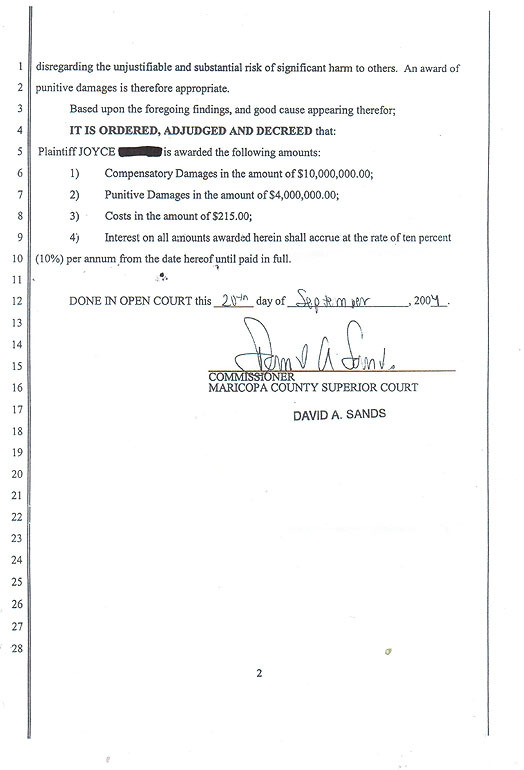 An award of punitive damages is therefore appropriate. 4) Interest on all amounts awarded herein shall accrue at the rate of ten percent (10%) per annum from the date hereof until paid in full. 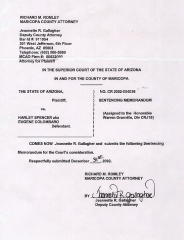 COMES NOW Jeannette R. Gallagher and submits the following Sentencing Memorandum for the Court’s consideration. Respectfully submitted December 31st, 2002. **PLEASE NOTE: IT WAS IMPORTANT FOR ME TO SHOW THAT SPENCER AKA. COLOMBARO WAS CONVICTED IN TWO COURTS – CRIMINAL AND CIVIL. O.J.SIMPSON WAS ONLY CONVICTED IN ONE. A.R.S. 13-702 (C) sets forth the aggravating factors the Court is to consider in determining the appropriate sentence to impose on a defendant. In the instant case, two statutory aggravating factors apply, namely that the murder of Adam Clark was especially cruel pursuant to A.R.S. 13-702 (C) (5), and the emotional harm caused to Adam’s family pursuant to A.R.S. 13-702 (C) (9). There are also several non-statutory aggravating factors that apply pursuant to A.R.S. 13-702 © (18). a victim for a certain period of time in order for a finding of cruelty to made. In fact, a fining of “especially cruel” is not limited to the issue of physical pain. “… (A) crime is committed in an especially cruel manner when the perpetrator inflicts mental anguish or physical abuse before the victim’s death.” (Emphasis added) State v. Walton, 159 Ariz. 571,598,769, P.2d 1017 (1989). Once again the cases do not set forth a particular time requirement but only state that … “the state must prove beyond a reasonable doubt that the victim was conscious and suffered pain or distress at the time of the offense.” State V. Jiminez, Ariz. 21,859, P.2d 131 (1993). testified that one blow could have caused all of the internal damage but Adam also had bruising on both sides of his body. Those had to have been inflicted separately. Dr. Keen testified that after his liver had been torn almost in half, Adam would have been in excruciating pain. While Adam suffered from Cornelia De Lange Syndrome, he felt pain just like anyone else. Dr. Robert Miller testified to that in connection with Adam’s broken leg. He cried when Dr. Miller moved his leg. It is hard to imagine a death more cruel than the one Adam suffered. The emotional harm done to Adam’s family was extreme. The Defendant sat by and watched Adam’s mother, Joyce Clark be charged with the murder of her son. He watched her lose custody of her daughter, XXXXX. He watched her lose her home to pay her legal expenses. Not only did Joyce Clark lose her son, her “miracle baby”, her whole life was destroyed. For nineteen (19) years, Mrs. Clark lived under the cloud of suspicion that she had murdered Adam. Summoning strength she probably did not know she had, Joyce Clark survived. She went on to become a nurse and a bereavement counselor. She survived but will never recover from the emotional damage caused by the defendant. Adam’s sister, XXXXX, has also been irreparably harmed by the Defendant’s conduct. Until she sat through the trial and heard the facts of what really happened to Adam, she thought her mother killed her baby brother. Until Adam’s death, XXXXX and her mother had a close relationship. Now they have no relationship al all. XXXXX lost not only her brother but her mother as well. Not only are there two statutory aggravating factors applicable in this case, there are also factors the Court should consider pursuant to A.RS. 13-702 (C) (18). That section provides that the Court may also consider any other factor the court deems appropriate to the ends of justice. One such factor is Adam’s age. He was only six (6) years old when he died. The age of the victim is not a statutory aggravating factor in son-capitol cases but is it in death penalty cases. It should be considered in both. The State also asks the Court consider the helplessness of the victim in determining the Defendant’s sentence. Adam was physically and mentally retarded, weighing only 22 pounds. He had only one hand and his left leg was in a cast. Adam was totally helpless and the Defendant knew that when he beat him to death. In regard to mitigating factors, it is the State’s position that there are none. 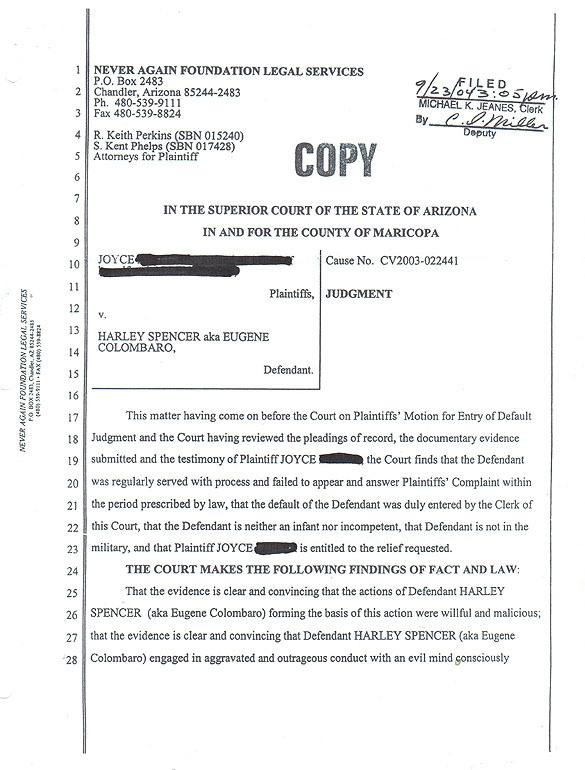 While it is true that the Defendant has no prior criminal convictions, in State v. Webb, 164 Ariz. 348,793 P.2d 116 (Ariz.App1990), the Court of Appeals noted as follows: Id. at 355. A sentencing judge is not required to consider a defendant’s lack of a prior criminal record as a mitigating factor. In determining punishment the court should consider not only the circumstances of the offense but also the character and past conduct of a defendant. In this manner, punishment may be set in accordance with defendant’s general character and the nature of the crime committed. (Citation omitted). Id. at 18. The Sentencing court may also consider a defendant’s demeanor during trial “and draw conclusions about his character there from in determining a proper sentence to be imposed”. 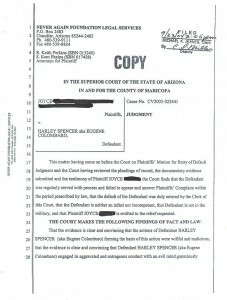 State v. Schneider, 148 Ariz.441, 449, 715, P.2d 297 (Ariz.App.1086). (names of three children and two women who have asked to remain anonymous for the sake of their privacy), that detail the abuse the Defendant has inflicted on others. The picture they paint of the Defendant is quite different than the one he portrayed at his release hearing last spring and at trial. What the Defendant did to Adam Clark was neither an aberration nor an isolated incident. The statute of limitations bared the State from charging the Defendant with all of his past crimes but the Court may now consider it in imposing Sentence. Due to the Defendant’s past conduct, his lack of prior convictions to be a mitigating factor. For nineteen (19) years the Defendant has gotten away with murder. He cruelly beat a helpless child to death and watched the Clark family be destroyed. For this, the Defendant deserved to be sent6enced to the aggravated term of twenty-one (21) years in the Department of Corrections.